1:42:06 PM 11-Feb-2019: StationPlugInManager: Loading station drivers. 1:42:06 PM 11-Feb-2019: StationPlugInManager: Loaded Columbia Micro Server. 1:42:06 PM 11-Feb-2019: StationPlugInManager: Loaded La Crosse WS23xx. 1:42:06 PM 11-Feb-2019: StationPlugInManager: Loaded WH3080 (Solar/UV). 1:42:06 PM 11-Feb-2019: StationPlugInManager: Loaded Oregon Scientific WMR-200. 1:42:06 PM 11-Feb-2019: StationPlugInManager: Loaded WH1080. 1:42:06 PM 11-Feb-2019: StationPlugInManager: Loaded Davis Vantage/Pro/Pro2/Vue/Envoy. 1:42:06 PM 11-Feb-2019: StationPlugInManager: Loaded Davis WeatherLink I.P..
1:42:06 PM 11-Feb-2019: StationPlugInManager: Loaded WMR 928/968. 1:42:06 PM 11-Feb-2019: StationPlugInManager: Loaded Oregon Scientific WMR-88. 1:42:06 PM 11-Feb-2019: StationPlugInManager: Loaded Instromet. 1:42:06 PM 11-Feb-2019: StationPlugInManager: Loaded Davis Monitor/Wizard. 1:42:06 PM 11-Feb-2019: StationPlugInManager: Loaded Netatmo. 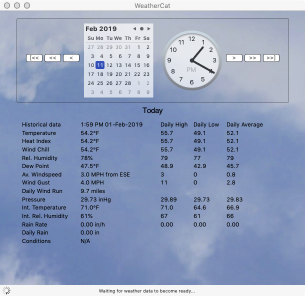 1:42:06 PM 11-Feb-2019: StationPlugInManager: Loaded WeatherHawk (Web). 1:42:06 PM 11-Feb-2019: StationPlugInManager: Finished loading station drivers. 1:42:06 PM 11-Feb-2019: StationPlugInManager: Starting driver Davis Vantage/Pro/Pro2/Vue/Envoy. 1:42:08 PM 11-Feb-2019: ***ERROR*** Camera is enabled but the camera was not found (Is it in use by another application?). 1:42:10 PM 11-Feb-2019: WeatherCat - Camera was not found when WeatherCat launched. Please check it. 1:42:10 PM 11-Feb-2019: Camera failure admin alert sent to admin email addresses. 1:42:11 PM 11-Feb-2019: Update found. It looks to me like somehow my Weather Envoy has lost my weather station, but I can't understand why this could have changed. Worse still, Mojave no longer supports running applications in 32-bit mode, so there doesn't seem to be any way for me to run WeatherLink and see what is going on. I have reinstalled the Silicon Lab driver, replaced my preferences, and downgraded to WeatherCat 3.03 - no improvement. I'm definitely feeling like my back in against the wall on this one. Anybody have some thoughts on what I could try next? THIS is the reason why I put off changing computers for as long as I could! I put WeatherLink on my old MacBook and a compatible driver. The stations shows up just fine. There is no problem collecting the data. The transmitter IDs are just as I left them. I also tried going through a USB 2.0 hub just in case the problem was my new USB 3.0 hub. Alas no difference. Being between a rock and a hard place, I realized that WeatherCat 3 will still run under Mavericks which is all I have running on my old MacBook. Still, I took a chance and moved all the WeatherCat files over to the 2009 MacBook. WeatherCat had no trouble pulling the data off of the Weather Envoy and is now purring like a kitten. At least I won't lose any data until I figure out a solution to this. But wait there is more . . . . . trouble. The venerable USB Sound Blaster Wireless for iTunes wireless adapter doesn't work either. So I need to find some sort of a wireless audio signal relay and these seem to have basically gone extinct. Grumble, grumble, grumble . . . . I bought a new USB 3 hub to connect the drives which used to be connected via Firewire. I also have a KVM switch that I use to switch between the old Mac mini that runs the household firewall and my main operating computer. Just in case either of these devices could have been interfering, I ran tests removing each device and checking if WeatherCat could finally connect to the weather station. The failure is 100% consistent. I'm going to send Stu a quick email to see if he has any idea. Otherwise I think my only option is to switch to an IP data logger. Oh well,. . . . I use EvoCam 5.0 to capture the image and save it in my Documents folder in a folder called EvoCam 1. Then I use WC to get the image from that file works really well for me. And you can have it get an image every 5 seconds if you want, I all so have instructions for it to record 24/7 into another folder from midnight to midnight. Stu replied to my email in a hurry and zeroed in on the key problem. I had reinstalled the Silicon Lab driver not knowing that new drivers needed to be authorized in the privacy and security pane of the System Preferences. When I installed the driver a second time and provided the authorization WeatherCat had no trouble accessing the Weather Envoy. I still have a bunch of secondary problems including no longer being able to access my FTP services for my website. However, at least WeatherCat is running on my new Mac mini and just in time for the next Pineapple Express rain event!